As much as I adore Sophie Kinsella's Shopaholic series, I also love her stand-alone novels. There are always new characters to meet and some interesting situations that she puts them in. This time around, I enjoyed meeting Fixie and her family. I Owe You One is a delightful story from start to finish. I had such a great time reading it. There were some great laugh-out-loud moments. Fixie had a huge problem to solve and I wasn't sure of the direction the situation would go. However, I was pleased with the end result. I learned a lot about running a family business and the parts about helping the store boost their sales were interesting. I could see myself shopping at Farr's if I lived in the UK. I could easily picture people, places, and things throughout the story. 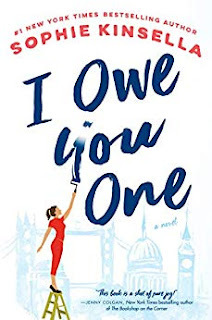 This novel is another winner from Sophie Kinsella and I'm excited for whatever she comes up with next! Thanks to The Dial Press for the book in exchange for an honest review. They have one copy to give away! Giveaway ends February 4th at midnight EST. I knit and so someone I know is learning how to knit and she was having a few problems and dropping stitches and I helped her along teaching her how to pick up stitches and or go back and redo rows. I fixed a leak under the kitchen sink. Really, it was just something that needed tightening, but I figured it out on my own. We fixed a broken hinge on our fence so it would close properly. I helped a friend of mine crochet mats for the homeless which are made out of plastic bags you get from the store. Thanks for this amazing chance. I fix the small and minor problems in the house which is usually straightforward and easy. I fixed something on my computer by looking it up online from my phone. I fixed a folding door. I took my doorbell off the house to charge the battery and put it back on the house. I helped my granddaughter fix her toy boat. I changed the washer in two taps. After asking my husband 100 times, I finally ordered the parts and fixed a broken cabinet door myself. It was easy - but don't tell him that! Not to brag or anything, but I totally just fixed the barbie house door, and...all by myself, haha! :) Very much looking forward to reading this new book! Sophie is one of my all time favorite authors! I sewed up a hole in my granddaughter’s pillow. I fix students' brains daily, or at least I try to. I hope they get some use out of the skills I am giving them! I fixed a scheduling conflict at work! I fixed a leaky faucet. I don't do a lot of fixing around our house... but I did do some touch up painting last summer! We fixed a hand rail!